After yet another mass killing by a bad guy with guns, are we ready? After more kids have been terrorized and more innocent Americans have been killed, after yet another angry citizen decided to shoot up a group of average people in a seemingly safe place, are we finally ready to ask the question? Within a half hour of the most recent shooting, just like the last one and the one before that, I have heard NRA spokespersons giving the usual tired and empty explanations. Well, duh, as the fifth grade would say. No kidding; if you make something illegal, the bad guys will still find a way to do it. If you pass a law to try to stop violence, you won’t actually stop every act of violence. Is this REALLY your best argument against sensible gun laws? Seriously? OK, let’s take your argument to the next level, shall we? Given that people continue to exceed the speed limit, even though there are laws defining that limit, we should just get rid of the law, and let people drive as fast as they possibly can on our crowded roadways. Sure, people will be killed, but what can we do? Given that people continue to steal goods and money from others, even though there are laws making that behavior a crime, why don’t we just eliminate all of the laws against larceny? Sure, weaker people will be robbed blind by stronger ones, but what the hell? Laws can’t actually control behavior! And how about this one? Given the fact that people continue to assemble in public places to protest against both government and special interests, even though there are countless laws, both old and new, which try to make those protests illegal, maybe we should get rid of all of them and just let people gather together and demand change. Making something illegal doesn’t mean that it will go away! Let’s get rid of tax law, since everybody tries to get around it. Let’s get rid of all of the laws making violent crime illegal, since clearly there are still too many violent crimes. 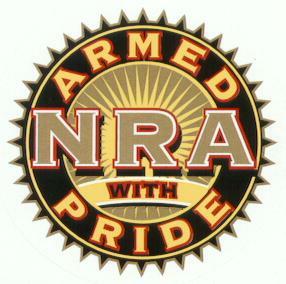 NRA, is this SERIOUSLY your best argument? Before there is a shooting in my town, my church, my classroom, I am more than ready to bring up the topic of logical, sensible gun laws. And your generally pretty quiet about these these things friend stands right beside you. Oh, you know I am NEVER quiet, but this is even more upsetting than my usual complaints. How many kids have to get shot up before someone at least tries to limit the assault weapons? What an insane place this has become. it is the nature of criminals to commit crimes. Murder is aganist the law, it didn’t stop this murder. It is both foolish and naive’ to even suggest limiting liberty on law abiding people will enforce laws upon those who have no regard for the law. Your position is wrought with falacy. It is Like suggesting restricting car ownership to the general public because some fools drive drunk. It is indeed a good thing the constitution protects me from nonsence like yours. You are absolutely correct; it is in fact in the nature of criminals to commit, and yet we have countless laws to try to deter them. You are making my point for me. We try to make mass murder as hard as possible to commit, in every way except with our gun laws. And I am not at all sure that your ” liberty” to carry an assault weapon trumps my ” liberty” to go to a movie or my church without fear of being slaughtered. we call it the 2nd amendment. I dont live in fear. If you were skilled in the proper handeling of weapons and trained to protect yourself, you would not have to live in fear either. Educate yourself and protect yourself. When will people learn that Laws , the police or the government can’t protect you or your family. I guess we could debate the meaning of the second amendment, as constitutional lawyers continue to do. I would simply suggest that the very idea of everyone bearing weapons in the event of a shootout would set us back to the wild west days. I have no desire or interest in carrying firepower around with me; the Constitution guarantees us many things, including the right to “life, liberty and the pursuit of happiness” as well as a government which “insures domestic tranquility”. Why can’t you at least agree that having the right to purchase multiple assault weapons and thousands of rounds of ammunition (like the killer in Colorado did legally) is a remarkably stupid idea. And I DO live in fear. I have never broken a law more serious than a speeding violation in my life. I am a teacher, a mother and a nice person. Why do I have to live in fear just so that you can carry all the guns you want? If I learn to shoot, and start packing, it will most certainly not add to to my sense of safety. I appreciate your comments, but I’m going to close this topic off now. I find you, and those who think like you, to be just too sad to contemplate anymore. In a good way, or in a “are you nuts” way? In a “I find this argument totally incomprehensible” way. Actually, I don’t even find this argument to be an argument – “I should be allowed to have a gun because I want want one” is the mindset of a 3-year old. Just read this one- They definitely lose me when they get to the super assault rifles and all that. That stuff goes way beyond self-defense and like you said back to the wild west. And all this 2nd amendment stuff- well it’s supposed to be about having a well armed militia, not about every fool out on the street carrying all kinds of weapons that hadn’t even been invented yet. It’s all about feeling powerful. Crazy stuff!